I’ve been doing surveys since I was 17 years old. It started out being a great way for me to make some money in a quick amount of time, and work with some fantastic brands. By far, my favorite assignment was with a brand name cereal company. They paid me $100 for a 3 month assignment, in which I was part of a test audience for them to pitch a few new ideas to. I showed up twice a week, got my $100 and by showing up consistently, I also won a prize, I think another $100 or so. You won’t get rich doing surveys, and there are a TON of scams out there. At one point, believe it or not, I was registered with 312 survey companies. Most of which were not legitimate. This was all before SurveyPolice came out. SurveyPolice is a fantastic site that you can search by company and find out if the one you want to apply to, is legit…or a scam. It became my best friend. 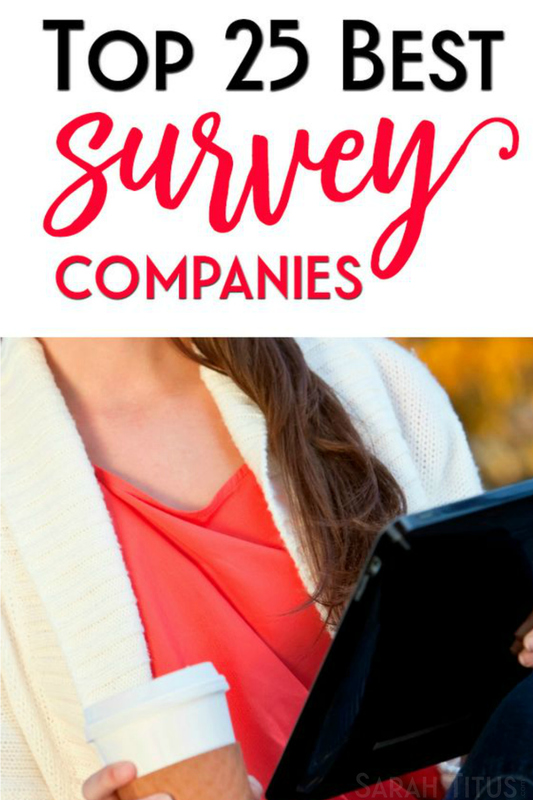 Over the years, I have come across so many survey companies and it’s only been this last year, that I stopped doing surveys. I just didn’t have the time anymore. Below, I’ll tell you the top 5 survey companies you want to join. If you don’t join all of them, join these 5. They will pay the most, give you the most surveys, and are the easiest and least time consuming, least red tape ones available. 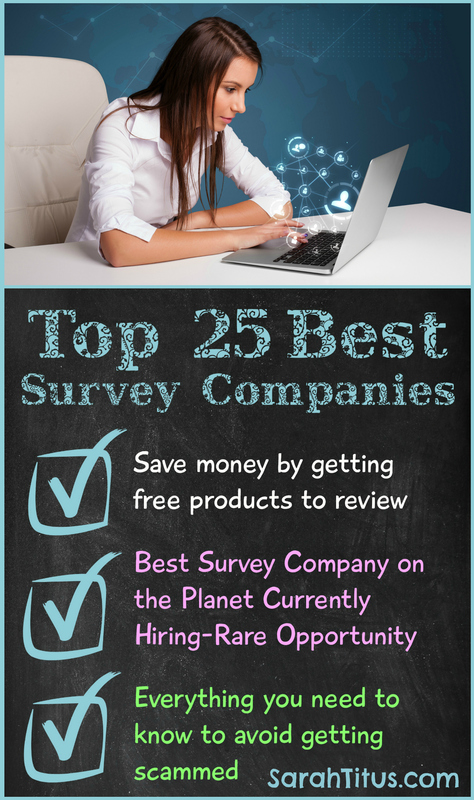 Then, below that, I’ll show the Top 25 best survey companies. If you want to make money from home, this will be a great list to bookmark as well as my article, 10 Ways to Earn Cash from Home. This will always be my go-to #1 company. They pay extremely well and because of that, they are extremely hard to get on. I have had friends wait up to 3 years to score a link to get on their panel. You have to scour the internet to find an ad to join and the ads disappear as fast as they put them up. It’s almost impossible to get in. They are super exclusive. With that said, RIGHT NOW, in the biggest news ever (and the reason for this post), they have allowed me to put up a link to join their site!!!!!!!!!! They are looking for people just like you! They could notify me to pull the link at any time, so hurry and join! You have to fit into one of those categories to be accepted, however, I will tell you that if you want to do surveys, I’d apply anyway, even if you’re not in one of those categories. They might approve you and you’re in with the best survey company on the planet. If you have friends who want to join, tell them. Because even if you get it, you CANNOT get them in later. There’s no friend referrals with Pinecone! Pinecone Research is unlike other companies, in that, they sometimes will pick you to try a product. That’s right! You will get a FULL SIZED version of the product for free to try PLUS compensated for your review. This is a great way to score free stuff, things you like and will use, and be paid for it. I can go on and on about how awesome Pinecone Research is so you’ll have to excuse me now. lol. Opinion Outpost (Canada click here) is my second favorite survey company. They have a lot of survey’s available. They pay almost as good as Pinecone Research, but unlike Pinecone, there are not any product reviews, thus no free product and no bigger commissions. With My Points, you earn points to cash out, but it’s not limited to just surveys. You can earn points by doing all sorts of things and rack up points pretty quickly. They used to even have contests where you could win points. Not sure if they still have that or not, but it was pretty cool. E-Poll is a great company that I’ve made a lot of money with and you can cash out faster than a lot of other places. Sometimes the surveys are kind of boring, but it’s really easy work for easy money. HI Sarah! I was wondering if you would recommend this for a stay at home mom. I’m looking for something fun to help bring some extra funds into the house. Any thoughts? Please email me at your convenience. Thank you! Is there a site that pays you cash and not gift cards? I am single mom of two year old twins n honestly it would be cheaper for me to work at home because daycare cost so much please if you can direct me n a good direction so I can get started and make fast money for my babies I would be greatful!! I really need free to start and fast money. Thanks so much. Natasha, I would begin reselling. Buying things cheap or getting things free and reselling them. That’s the first thing I did when I got out of the homeless shelter and began making a full-time income on it! Be sure to get my free eBook, How to Quit Your Job and Stay Home by signing up for my newsletter. And here are two posts that will help. One is below and the other is here: 10 Easiest Ways to Earn Extra Income. I plan to show readers a lot more about exactly HOW to resell in the months to come, but that should get you started in the right direction. 🙂 Here’s an article of where to find things free to sell and here’s another article of 40 things you can sell right now. Peruse the making money section and you’ll find a lot of great information! Hi Sarah! I’ve recently found your pages from Pinterest for organizing tips and then i saw your stay-at-home mom articles and you’ve inspired me to become just that! My son is only 7 weeks old and I can’t imagine leaving him for work. So I checked Pinecone Research and there’s no place to sign up? Do I need to contact them and see if they’re hiring, or check their site as often as I can to see if there is a sign up option? Hannah, so glad you found the site. 🙂 For Pinecone Research, at the moment, I believe they are not hiring. They are very hard to get on with. 🙁 But also definitely worth the wait. I started working from home almost 2 years ago and around the same time finished my MBA in Psychology. The job I had that was work at home was great until it switched to phones. I was miserable. Lately, after getting scammed a few times I started writing online. Do you happen to know of any work at home jobs for a Masters Degree that does not require phones? Thank you and thanks for the opportunity of signing up. Are there any online surveys for people who are younger than 18? Thank you! I’m not sure Sarah. I was over 18 when I started, so that’s not something I’ve ever researched. Perhaps another reader might know? Hello Sarah, I am a stay at home mom and I am looking to find some ways to bring some extra cash into our house as we are having trouble making ends meet. So, these sites pay you to take surveys, sorta like quizzes? Is that all they require? And is there a commitment or can you stop at any time? I love reading your post Sarah, Everyone lifts me up and reminds of that poster you send out once – “I can’t but God can.” Along with your posts that’s been my guiding light. I really relate to your ‘do your own thing;’ My website doesn’t fit in anywhere on the web today but the message needs to get out there for families with aging parents – which of course I am one. “It’s not going to work” If I had a dollar from everyone who told me that, I would be much better endowed, but like you, God says – Do this – and who am I to tell Him “NO – it won’t work”. Thanks once again for inspiration and encouragement. I need it so badly. I love what you said about who are we to tell God it won’t work. He can do anything, after all. 🙂 Great attitude to always have. I was wondering if any of these survey companies would still work in Australia? Glad you like the blog. Welcome Nicole. <3 You know, I'm not sure about Australia. I'm in the USA, so I'm not familiar with outside of the USA. I'm sorry.